Is Vision Exercise Like Gym Exercise? If you’ve followed Dr. Bates’ teachings at all, you know he believed vision improvement is about relaxing the mind and the visual system, so it can function optimally. Straining is the enemy! And when you think of a gym workout, it’s all about lifting and sweating and pushing and pulling, iron plates and cables and your own body weight, which seems like strain. So do the gym and vision exercises have anything in common? The folks I’ve seen in the gym who get steady gains over time are the ones who are paying attention to what they’re doing, not talking to a neighbor while they work out, their mind only partly on the exercise. The same could be said of vision exercises. During a session of palming, you want to sink into the blackness, allowing your visual system to relax, letting go of trying to see anything. You do not want to worry about all you have to do, impatiently wondering when the palming will be over so you can be productive! The goal of gym exercises is increased strength, or flexibility, or endurance, basically overall body fitness. For vision exercises, the goal is an improvement in overall visual fitness, namely increased relaxation of the face around the eyes, more ease of eye movement (the Long Swing can help here), better focus on small details (practicing central fixation is useful for this), and using both eyes together as a team. 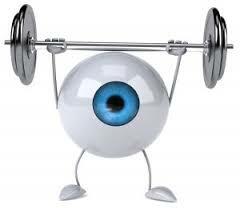 It’s a misconception that your eye muscles need to get stronger, which is why the picture of the eyeball lifting a barbell makes me laugh. If you don’t see clearly, your eyes are not weak and shirking. They are probably trying too hard! You want to let yourself see, not force yourself to see. 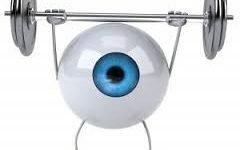 Now that I think of it, intention is behind both a satisfying gym workout and a satisfying vision practice session. I intend to do this to the best of my ability, knowing I’m continually improving, refining my technique as I go. Some people go to the gym to look beefier, or to impress the other members with how much they can lift. I think most folks go to the gym to be more fit, whether they’re in the gym or not. They want to climb stairs or lift heavy groceries without getting out of breath, or struggling. Similarly, vision exercises help you see better, and more easily, wherever you are, whenever your eyes are open. Maybe the most satisfying benefit from exercise is the increase in self-esteem, the confidence which comes from knowing you have improved your capacity to function as a physical being. Wouldn’t you rather see your eyesight as a joy, a precious gift, than see it as a big problem? This is under your control. Learn how to take care of your eyes and your visual system, giving them the nourishment and rest they need to stay healthy and functioning at their peak. Gently challenge your vision once in a while, like a game. Can you see details farther away, or closer, than you expect? Can you go for a walk after dark and see well enough just with the street lights? Can you see better than you thought without your glasses, or with an older weaker pair? You have more control over your visual fitness than you may realize. Your eyes are just waiting for you to take the reins. Lately my natural vision and confidence have greatly increased. And I think that they may be related. In the past I would not dare to do things that would make me stand out (that even includes nice things for others) but nowadays I just do what I want. I am not sure if NVI is the cause of this but it might be. My theory is that if people relax to improve their natural vision then they also reduce the nervousness that they experience. And since nervousness signals uncertainty to them nervousness makes them scared. Thus if the nervousness goes away they become less scared. I think that NVI can do more than improve natural vision just like cycling does more for people than make them better cyclers. Bates also wrote about what other advantages NVI can give you, like being better resistant to pain (though I can not confirm if he was right about that). It is important to view the body in the holistic way since the body does work holistically. Training ones eyes might do more good then just improve ones eyes. Dr. Cyber, I see it that way too. 🙂 You can reinforce the positive feedback loop, reaching out more then feeling more confident so reaching out even more, or the negative one which I do think is contributed to by glasses. I’m happy for you about your progress. The long swing, is a simple perfect exercise to personally massage the spine, return mental and spiritual balance for the chakras to align energy to connect feel grounded awake.